Windows Vista has a nice "Reliability and Performance Monitor" which gives you an index of system reliability. Just click START and search for "Reliability" or type in perfmon.msc. It tracks application failures, so you have an idea when things went downhill. I could tell that the application failures I had were related to spoolsv.exe and began on 03/26/2007. While the "Reliability and Performance Monitor" tracks application installs, it does not seem to track printers as hardware installs. Fortunately, I realized that I added a network copier and allowed it to install the drivers, which were actually designed for Windows XP. Right-click on the white space and click "Run as administrator > Server Properties"
Click on the "Drivers" tab, click on the offending printer and click on the "Remove" button. When prompted, click "Remove driver and driver package." Answer "Yes" when prompted to delete the driver. You will then see a dialog indicating that driver package information has been collected. Click on the "Delete" button. Back in the printer list, delete the offending printer by clicking on it and pressing the Delete key on your keyboard. For really stubborn printers that refuse to delete, note the files the printer driver uses and delete them while in safe mode. 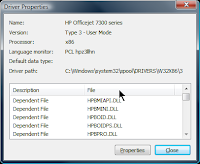 To do so, on the "Drivers" tab (see above), click the printer and click properties. Sort the "File" column alphabetically by clicking on the heading. Write down the files involved and also write down the "driver path" above the "File" column. Delete these files in safe mode, then repeat the removal procedure above. -Delete the contents of the directory (not the directory itself). -Retart the print spool service. Your advice saved me from reformatting my whole PC. Deleted the spool list and it runs like a dream! Didn't work for me... nothing in the folder? Thanks - worked a treat. Great advice. can u help me please?? 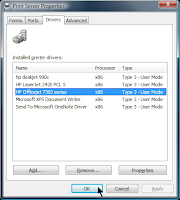 i tried to delete the drivers in the list in safe mode, but the printer and the driver still won't install. however, i plug my printer in, it'll automatically install the new driver (as it detects new hardware). but i'm getting the same errors after a while. it's so frustrating. Deleting the spool list solve the problem. I had installed a bad printer driver that was not meant for Windows Vista and ever since then, the spooler would stop working periodically about five or ten minutes.What worked for me was renaming the existing folder C:\Windows\System32\spool\drivers\W32X86 to W32X86_1 (right-click on the folder and rename. Now reinstall your known working printer. When asked if you want to keep the existing driver, say no install a new copy (not the recommended option in the dialog box) - the system recreates a new W32X86 folder without the offending drivers that are causing it to crash. tks PFLAG Atlanta. I unintentionally installed a bad driver from an old xp laptop. constant spooler.exe crashes resulted. Tried everything I could find on the internet to no avail. After renaming the file from safe mode, I am now connected to all 3 wireless printers on my home network. Life is good. Deleting the spool list solved my problem. When I entered "Control Panel - Printers", there was nothing but "Add Printer".